Results from friction between the greater trochanter and the iliotibial band during hip flexion and extension causeing microtrauma and bursal inflammation. Common: 5.6 patients per 1000 adults. The trochanteric bursa lies between the iliotibial band and the greater trochanter. Pain and tenderness over the affected greater trochanter. Pain is often worse when first rising from a seated / recombent position. Increased pain with adduction and internal rotation. Generally unable to lie on affected side. Pain may radiate into the buttock or down the leg into knee or ankle. 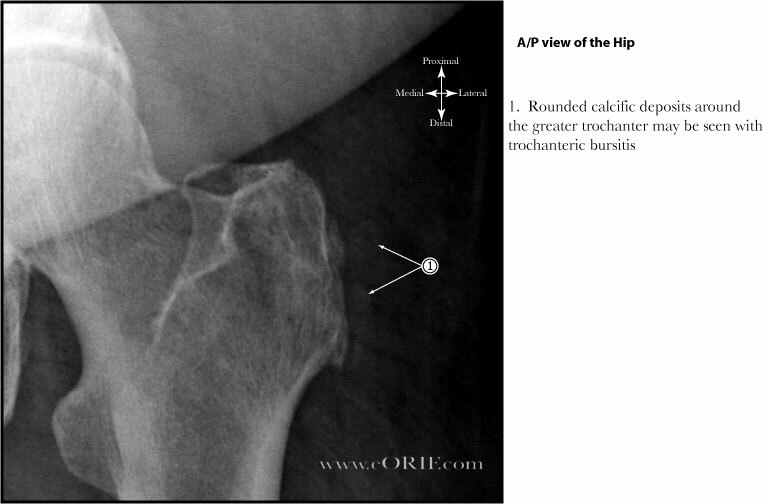 A/P pelvis, A/P and lateral of the affected hip. 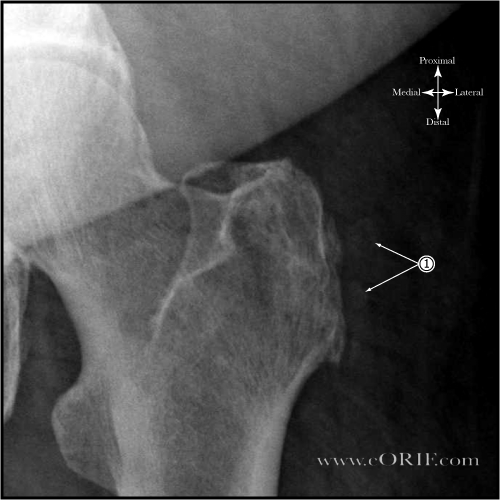 May demonstrate rounded or irregular calcific deposits around the greater trochanter. Consider MRI / bone scan if concerned for occult fracture or tumor. Initial treatment: physical therapy, NSAIDs, ICE, corticosteriod injection, short term cane use, weight loss. >90% successful, but recurrence is common. Chronic Recalcitrant: open or arthroscopic bursectomy. Gluteus medius tears, found in up to 22% of elderly patients. May consider repeat injection if initial injection fails or symptoms return. Avoid multiple steriod injections.